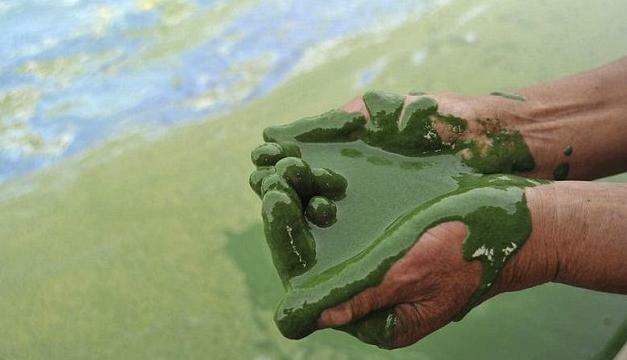 Contaminated: Anger is growing about pollution in China’s lakes, wells and rivers. 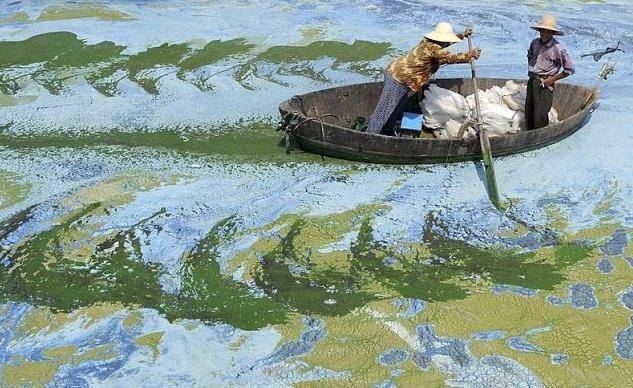 Pictured are fishermen rowing a boat in the algae-filled Chaohu Lake in Hefei, Anhui province. The Chinese government has promised to tackle ‘cancer villages’ – areas where pollution is so bad it has lead to a huge rise in diseases like stomach cancer – after a huge social media backlash from both ordinary Chinese people and global campaigners. There has been an explosion of outrage about cancer villages on China’s social media sites and blogs, which are used by increasingly powerful activists to raise awareness. Huangjiawa, a village in Shandong province, became a symbol of the growing environmental movement after it emerged that the area has one of the highest rates of stomach cancer in the world, news of which spread rapidly across Weibo, a Chinese social media site similar to Twitter. The wells in the village are believed to be contaminated with toxins from a nearby aluminium smelter, which also pumps pollution into the sky. The village’s plight caught the attention of activist Deng Fei, who has three million followers on Weibo, making it hard for the authorities to ignore his accusations that smelter bosses deliberately pump waste water underground. Last month authorities were forced to acknowledge the existence of cancer villages, A report from the environment ministry said that the widespread production and consumption of harmful chemicals forbidden in many developed nations are still found in China. Other cancer village cases have also hit the public consciousness, such as that of Chen Zuqian, a Chinese farmer who last month dared a local environment official to swim in his province’s polluted rivers and was been badly beaten. His family say the attack was punishment for speaking out. Chen, from the township of Banqiao in Zhejiang province, was among a number of local businessmen who offered the region’s top government official £21,000 to take the plunge. The official was then interviewed on TV and was derided for promising to swim in the river in ‘three to five years’. In 2009 Greenpeace campaigner Mariah Zhao gave a first-hand account of a visit to a family living in a cancer village in China’s Jiangsu province. She said: ‘When I first saw him I was in complete shock. Farmer ‘Wang’ lay on the bed, his ribs corrugating his hollow chest. His stomach was cut by a ragged stark scar from recent surgery. ‘He had intestinal cancer – one of many cancer victims in his village. Farmer Wang’s cancer, say his family, was caused by water pollution from the army of chemical plants which surround their village and farmland. 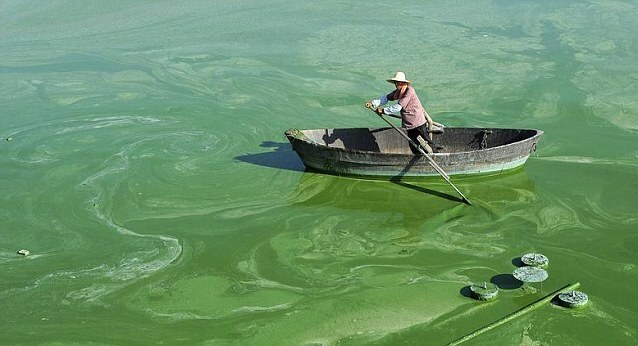 Farmers in China have no choice but to use polluted water on their crops. In the town Ms Zhao visited, grocery shops advertise rice shipped in from other places as ‘clean water rice’. Water pollution expert Zhao Zhangyuan, of the Chinese Research Academy of Environmental Sciences, said: ‘What harm is caused by groundwater pollution? High rates of illness. Geographer Lee Liu wrote in Environment magazine about Longling, a cancer village in Shaanxi. With a population of 154, the village had its first cancer victim in 1974. By 2001, 36 villagers had died of cancer and 22 had died of heart and brain diseases. Only four of the 30 families had not had a cancer victim, while cancer killed four entire families. The ruling Communist Party promised its people today that it will spend cash solve the country’s serious air, soil and water pollution problems which blights the lives of many poor Chinese people. Fresh drinking water makes up only six per cent of the total water on Earth, but all of the world’s population relies on it. Millions of people in the developing world rely heavily on groundwater, mostly through shallow dug wells. These can easily become polluted by chemical waste dumped by industry and mining concerns, as well as pesticides used in agriculture and biological waste from rubbish dumps. As well as directly affecting people who drink the water, the chemicals contaminate the soil and enter the food chain. Health effects from groundwater pollution depend on the specific pollutants in the water. Pollution from groundwater often causes diarrhea and stomach irritation, which can lead to more severe health effects. Accumulation of heavy metals and some organic pollutants can lead to cancer, reproductive abnormalities and other more severe health effects.